This post is one of a series written by Maia Sauren, an RMIT student who recently submitted her Ph.D. thesis. In this post Maia tells us how she shaved time off her PhD. 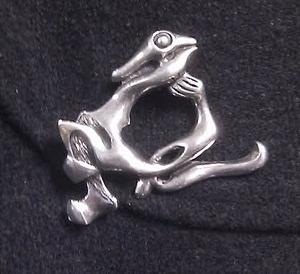 This brooch came from Norway. I have no idea what it’s supposed to represent, but I’ve decided it’s an image of Loki, the Norse god of strife. Like all chaos gods – Prometheus for the Greeks, Coyote for the native Americans – he symbolises change. And not just any change, but the kind of change that derails inevitable processes. It’s a bit like the opposite of tragedy, where the character’s downfall is assured because their character causes them to react in particular ways to their circumstances. I like having a bit of that element around the place. This is the somewhat convoluted story of how I shaved over two years from my Ph.D, by choosing not to stay on the path I was on. I got to a certain point in my thesis where I felt stuck. I was still running experiments at 10pm on Saturday nights, reading papers, writing the odd bit of stuff, but it felt like I wasn’t getting anywhere. I did some projections: at the rate I was going, it would take me three more years to complete. Panic stations! I spent a few days in despair. You probably know the kind – bursting into tears, being paralysed with fear every time I approached a computer, waking at 3 am wondering if the joy of quitting might outweigh the shame. At that stage I’d already been enrolled for over five years. My partner suggested that I needed to start approaching my PhD differently. If the problem was in my head, I could make into a different problem, right? I could change it into a problem I could solve a bit easier. I realised that the first I needed to do was stop thinking of it as The Only Thing People Ever Will Judge Me On, Forever And Ever. As long as I approached it with that belief, I’d never submit – it would have to be perfect. I don’t know that I ever managed it fully, but I did untangle my ego from it somewhat. A few people told me that I should hurry up and get it done because it’s ‘just a piece of paper’, which I couldn’t identify with. It may be ‘just’ a qualification, but my worth as a scientist and a researcher is judged, at least to some extent, on the thesis I produce. One of the most successful things I did was treating the PhD as if it were a paid job. In reality, I had just started a part time job writing a report for the state government, so I tried tying it into that. My partner and I concocted – drumroll, please! – MPI (Maia’s Ph.D. Inc), a company that had just taken on a contract for the state government. I was the company’s star employee, and my job was to write a 200 page report about some research that was done some time ago. By someone else. Someone who was definitely not me. There was a small problem with that, though. At work, I was busy learning all the difference between technical reports done by scientists for scientists, and government reports written by public servants for other public servants. Very different structures and requirements, let me tell you. The fear of not knowing how to finish the thesis got all mixed up with the fear of not knowing how to do my new job, and it all escalated and freaked me out. One aspect did work, though – that of separating the writing from the research. I found that if I pretended the research was done by someone else, I could write about it much easier. It didn’t matter so much that the experiments were good rather than great, or if the results weren’t quite what I’d been expecting. So I changed my job at MPI into one I knew how to do – writing journal articles (well, one massive journal article). I’ve done a few of those; the structure is well simple and defined, and I could do a quick and dirty information dump and edit later. Looking at the Ph.D as a project I was paid to do, rather than the thing that would define me forever, also gave me permission to treat it less reverently. I ditched three-quarters of the experiments I had been intending to run. I already had enough data to show proof of concept to a reasonable level. Looking back, I can’t believe I was seriously intending to do that much more work! My projected completion time line of three years suddenly shrank to 8 months. (In reality, it took me 14 more months to actually finish). I think the moral of this story is, if things ain’t working, do something else. The results might not be what you expect, but at least you’ll be in a different place. What is your Dark Side? Oooh I like this post very much for lots of reasons! Two things that ring ture for me (so far) are treating the thesis like one big journal article (yes!) and treating the process like a paid job. Thanks Maia! It made a difference to me to remember that nobody will actually read it. This is a great post! 🙂 I love the idea of MPI. Certainly, I also found treating the PhD like a paid job helps. And also useful advice to detach oneself from the PhD… need to learn to do that.